Baby spam! Paolo and Guy bonding with their babies. I have no idea which baby is which. Ok, so I gave them a bigger house and these are the looks I got. Apparently, they did not approve of the new house. Paolo, please just eat Guy’s grilled cheese! It’s sitting right over there on the counter. Earwax salad, yuck. He ate his earwax salad and enjoyed it. Yucky. Guy created an art club and invited the club to his house. He then proceeded to tell himself a story. Cassandra looks like she’s trying hard not to laugh. I grew up the twins and tried to take a picture of them both together. Failed! Either one wasn’t looking at the camera or making a weird face. So, I had to take them separately. I think they look more like Paolo than Guy. That may change when they’re teenagers. Here’s Kristine, she has Paolo’s hair color and Guy’s green eyes. Jessica also has Paolo’s hair color and Guy’s green eyes. Kristine’s homework is encoded on her hand. No, seriously, I don’t know where her book is…invisible? I love his face after they kissed. Very pleased with himself. Guy, on the other hand, looks lost in thought or smirking. He’s supposedly feeling confident. Smallish update: I still don’t know if I’m doing radiation. I thought I would talk about it with my oncologist but she referred me to a Radiation Doctor. My appt. isn’t until the 7th. More waiting. My surgery took 6 hrs. Basically, I had two surgeries at once. First, the Oncologist Surgeon removed the tumor and 7 of my lymph nodes then the plastic surgeon inserted tissue expanders. I have to have tissue expanders before I have breast reconstruction. That’s so my skin is stretched enough to accept the breast implants. So far, I’m still sore. I’m thinking it’s because I still have two drains. Can’t wait for those to be removed. They have to be draining 30cc or less for two days. Today – 45cc. Ugh. It’s hard to be patient sometimes. He has mastered the art of hovering. Why sit in a chair when you can hover? Playtime! Looks like the kitten is joining in as well. I finally collected all the ghosts and bought this thingy(can’t remember what it is called). 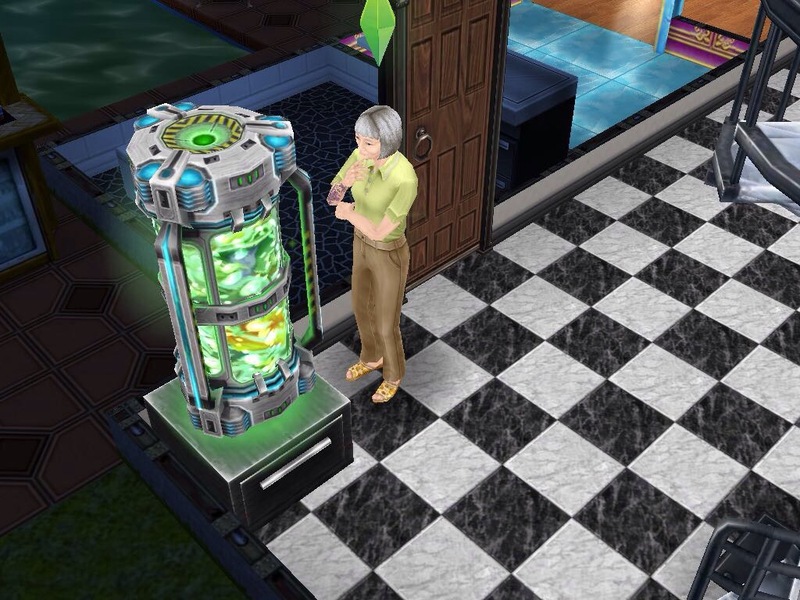 Granny is wondering if any of her deceased friends are in there. 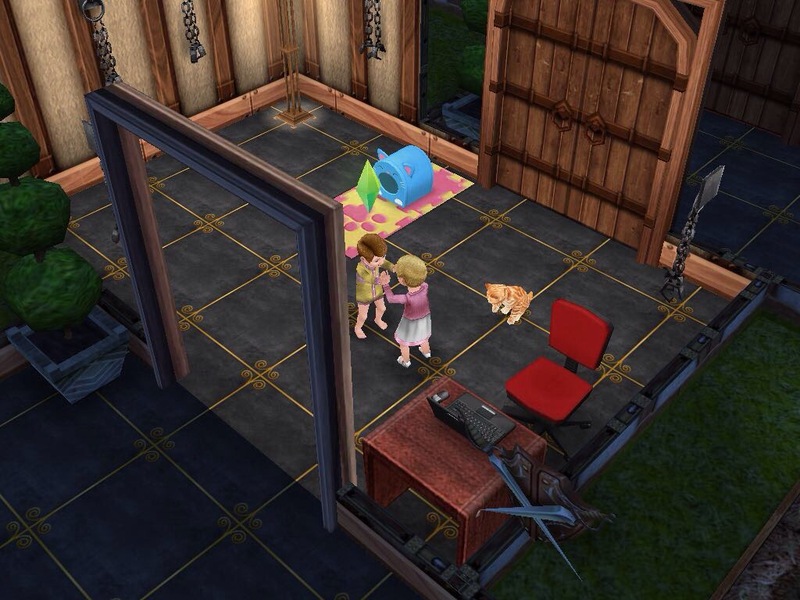 Could be…plenty of my Sims have passed on. London is working on his water heater. 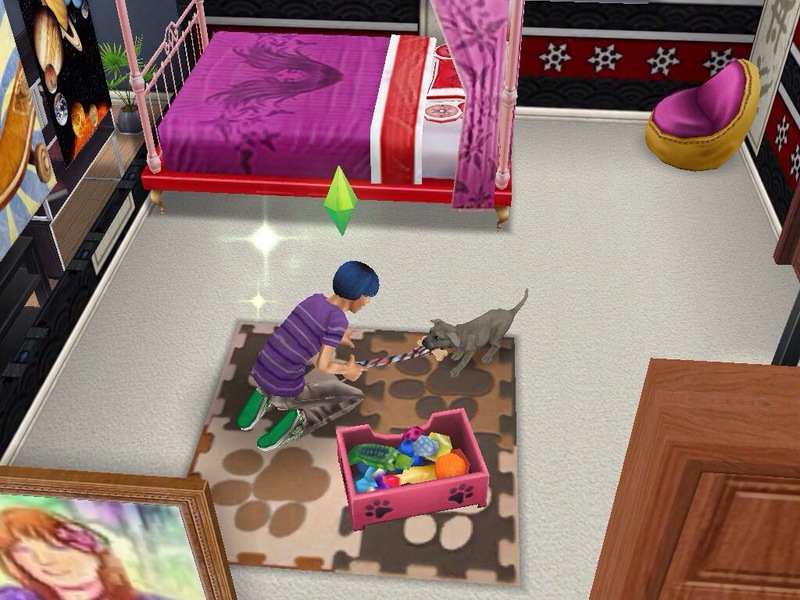 Too bad Sims Freeplay doesn’t have a handiness hobby. My puppy refuses to drop his dog biscuit. I can’t figure out how to make him drop it. Weird glitch. I haven’t been playing Sims 4 for a few days now. My armpits hurt from the surgery and I have a hard time holding my laptop. I’m hoping that in a few days I’ll be less sore. I’m using my iPad…trying to get used to using WordPress on it. The surgeon told me that my cancer was completely gone. Yay! Monday I see my oncologist and will probably discuss the possibility of radiation treatment. I don’t really want to do radiation. I really am tired of all this medical stuff. It’s been 8 months since I’ve been diagnosed and I’m only halfway done with treatment 😕. Guy opens his shop one last time. After talking with Paolo, he decides to focus more on painting than his business. He sells the shop at closing time. Looks like Zoe is talking his ear off. Paolo asks Guy out on a nice quiet date. He even made some grilled fruit. They have a nice, relaxing dinner overlooking the ocean. On the way to the bonfire….. Guy goes in labor, Paolo freaks out and races off to take a nap. This is the first time I’ve seen Guy look so miserable. Going into labor pretty much ended the date. No medals…received a notice saying that it was the worst date ever. Thanks game *sarcasm*. I wasn’t paying attention to Guy and how far along he was in the pregnancy. He hadn’t been out of the house since he got pregnant. I really thought he had more time. Nope. Since, Guy drank some TV offer juice to become pregnant, they went to the hospital. Poor guys. They both are bushed. Look how huge Guy looks…I hope he makes it to the hospital bed. At least the doctor is wide awake and chipper. Poor Paolo. So tired and so stressed…he didn’t follow Guy instead he ran off and started working out in the hospital’s gym. Normal healthy little girl. I thought I had a picture of Paolo holding one of the babies in the hospital. I can’t find it anywhere. Yep, they had twin girls. Jessica and Kristen Blizzard. I did not see that coming. Now I really need to fix their house. Happy Valentine’s Day! Paolo decides to meet Marcus at the gym. They haven’t hung out much since he got married plus he had heard a rumor that the coach was considering promoting him. Paolo really wanted a promotion especially with a baby on the way. Marcus was pretty close to the coach so this would be perfect. Find out if the rumor is true and work out. Another thing, Paolo could have sworn he saw Guy look at Marcus with goo-goo eyes. “Maybe, he was ogling Marcus’ muscles,” thought Paolo. He couldn’t bring himself to ask about Guy but did ask about the promotion. This is a gym trainer. I don’t remember his name but there he is in all his huge glory. I was going to take pictures of Paolo working out with Marcus but didn’t so I give you this gym trainer. A lot of the gym trainers in my Sims games are huge. Sometimes, they look more overweight than buff. Side note: Guy did flirt with Marcus at some point but Paolo didn’t catch him. They had invited some friends over and I was focusing on Paolo when I noticed someone was in their bed woo-hooing. Well, it was Guy and Marcus. I was so upset I didn’t play them for a week. Then, I got over it. So far, Guy has been ignoring Marcus. It must have been a one time fling. “So, Mr. Tub, you think I should put a baby room downstairs or upstairs? How about in my shop?” It’s always good to get advice from your tub. “Bed sounds good. But first a movie!” Guy has been happy and restless during his pregnancy. If I leave him alone, he wanders around doing random things. Talking to the bathtub, painting, drinking and if Paolo is around, he flirts and talks to him. I beginning to think that he drinks more than he eats. That little chief hat doesn’t mean he’s cooking, it means he’s going to make a drink. Guy was happy that Paolo got up to watch a movie with him. Paolo wasn’t really interested in the movie, though He spent the whole time eating popcorn and sweet talking Guy. “Paolo, watch the movie!” Ha Ha! That’s a link to my 2nd attempt at editing. I really didn’t mean to have the link embedded into the text. I didn’t know that wordpress could do that. Oh well. Yesterday, I realized that I attempted to edit the second video while recovering from surgery. I’m still recovering but I’m less foggy headed. Maybe 3rd attempt will be better. “Kiss me m’lady.” “Oh yes, handsome knight.” Her husband doesn’t appear to notice that she’s kissing someone other than him. Maybe, he thinks the guy is a statue. Hmmm, looks painful. Light, do you find a fishing pole shoved in your face painful? “Yes, yes, I do.” He ended up beating her up and declaring her an enemy. 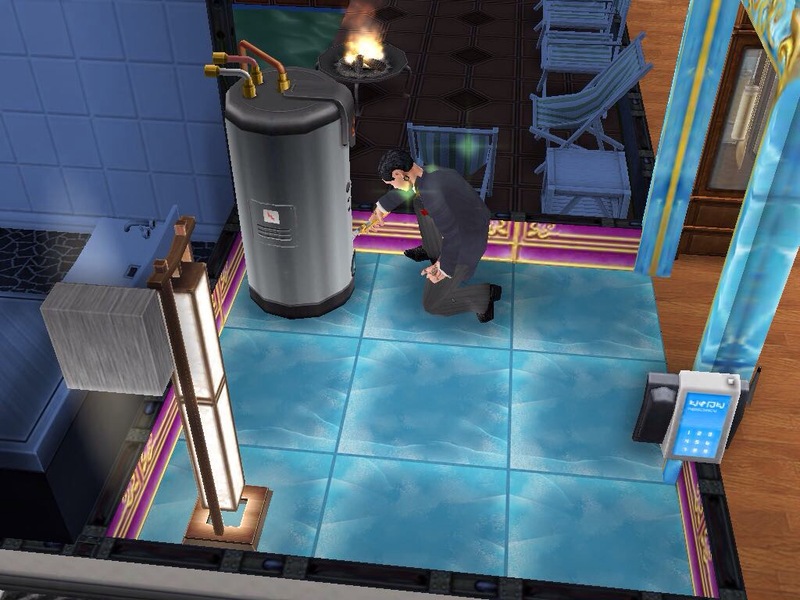 If you ask me, I thought his reaction was a little overboard but this is Sims. “Yay! My house is on fire!” Haven’t seen this reaction, yet. I had to make him put out the fire otherwise he would have just stood there and clapped. Finally, putting out the fire – with a little prompting from me. Feeling so confident from his fiery afternoon, he decides to play card games. Update: I had a bilateral mastectomy on Weds. Discharged from the hospital on Thursday. Feeling a bit better today (Tuesday). Next week, I will see my oncologist and probably discuss what stage the cancer was and my radiation schedule. Not to keen on getting radiation but then I’ll know that I will have killed the cancer. I don’t mind answering any questions about breast cancer or surgery. It’s a scary, tiring, painful and hopeful process. This is Paolo Rocca. He and Guy met at Discotheque Pan Europa in Windenburg . They hit it off and quickly became friends. Paolo invited Guy to join the Partihaus Club. Guy responded with an estatic yes. Little did Guy know that Paolo really wanted to flirt with him. Turns out, Paolo felt safe doing some serious flirting with Guy during club meetings. Guy flirtly responded back and they soon married. I did not take pictures of them flirting – I really didn’t think their flirting was going anywhere but Guy had several romantic wishes involving Paolo. Random flirting and drinking soon followed by woohoo. More flirting, this time poolside. Joaquin “I’m so angry! I don’t know why I’m angry but I’m angry!” *kicks over trash can” Joaquin “Yuck, why is there trash all over the place. Now, I’m even angrier!” I don’t even know why they invited him over. They totally ignored him. 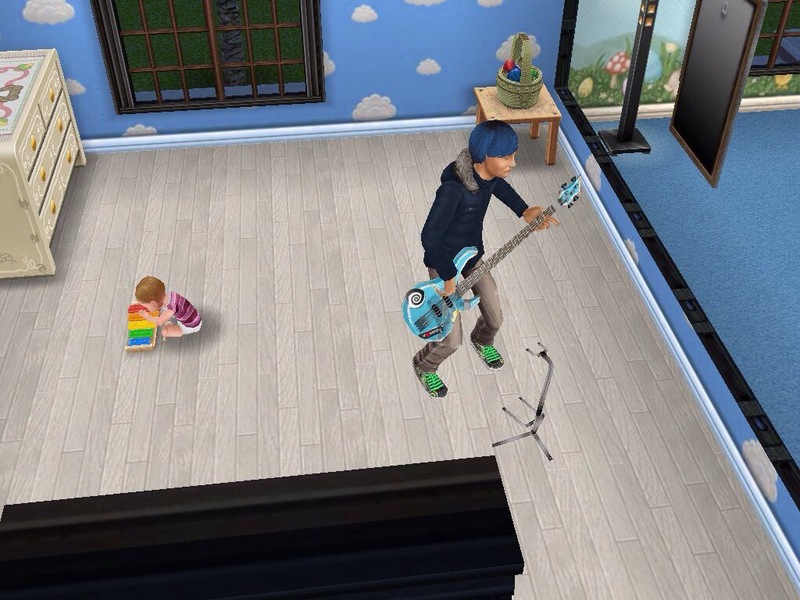 I had to make them talk to Joaquin so he would stop having tantrums. After Paolo heads off to work, Guy decides to open his store. He seldom opens his store. Even though, his shop is only open 2 or 3 days a week, he manages to always make money. “Don’t mind me folks. Just doing a little cooking.” Guy eating at work is a common occurrence. I really don’t know how he makes money. Paolo: Do you guys mind? I was planning to use this. Clara: Really, Paolo. You were just going to sit on me? Paolo: Yes, yes I was. Jade busting out some fire dance moves. Guy decides to tell Paolo some unexpected news. “Guess what, Paolo! I’m pregnant!” Overhearing the conversation, Jade wonders how on Earth that happened. She’s so confused by Guy’s pregnancy. She begins to wonder if the alien abduction rumors are true. Oh my God! I thought you were just eating too much. Awesome, I’m going to be a father but um how did this happen? Guy, “You see, I was watching TV late one night and this ad came on. They were giving away a secret pregnancy formula to the first 100 people. So, I called. As soon, as I got it in the mail, I made the drink.” Paolo, “Oh yea, I totally get it. I, mean, you know we talked about adopting but I didn’t think you could get pregnant. So, no aliens?” Guy laughed. “No. No, aliens. I made a drink and ta-dah!” Jade still wondered if aliens were involved. She could not believe that a drink could make it possible for a man to get pregnant. But, Guy seemed adamant about no aliens and Paolo wasn’t questioning the pregnancy. That’s as far as I got while playing. Yes, Guy is pregnant. He hasn’t started the pregnancy walk but he does have a baby bump.